How to Write a Pastiche that Sparkle$! I’ve read, like, so many Sherlock Holmes pastiches since becoming part of the Baker Street Babes, and I’ve even written some. That’s why I feel like I’m totes ready to tell YOU how to write a pastiche that will sparkle like a vampire in the sunshine and prance like millions of tiny unicorns. 1) Include TONS of historical people. It’s called playing The Game. 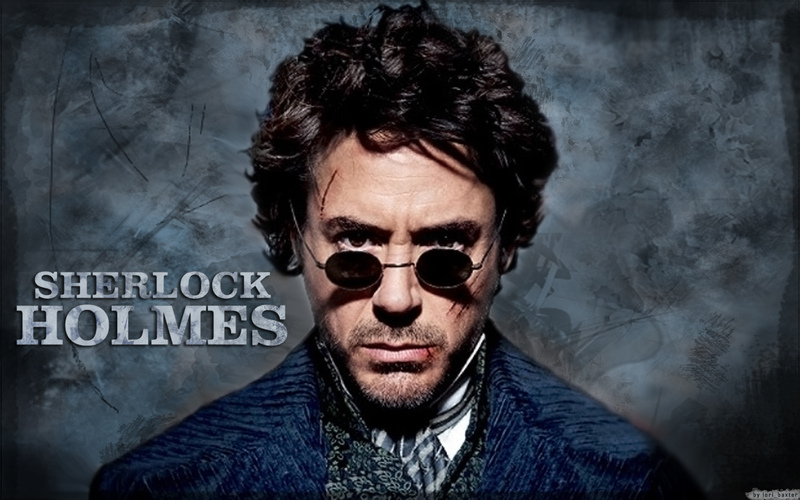 Who wants to read a pastiche where Holmes interacts in-depth with one historical person or situation? Subtlety is boring. Namecheck at least ten real-life characters, or you don’t deserve to call yourself a pastiche artist. 2) Make it ALL about the romance. It doesn’t really matter which characters you pick. I mean, people picking up a Sherlock Holmes mystery really wish they were reading a Harlequin Romance Novel. Give it to them! 3) Use EVERY trope. 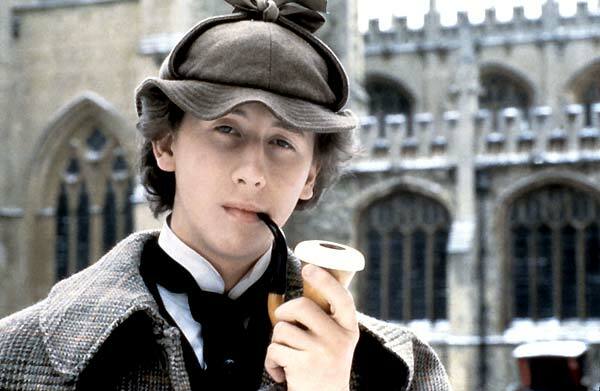 Sherlock Holmes smokes a pipe, wears a deerstalker, says “elementary,” and takes drugs for a reason! Talk about these things on every page, so people know without a doubt that they’re reading a real, live, Holmes story! 4) Make it PARANORMAL, baby! I’m not talking about tastefully atmospheric forays into Victorian spiritualism. Remember what we said above? Subtlety is for loooosers! Give us so some werewolves, a clairvoyant robot, and maybe a patronus or two! Make it worth our time. 5) Make sure all the speech is VICTORIAN. People back then didn’t talk like us. They said things like, “tut tut,” and “old boy,” all the time. If you get lazy and start making Holmes and Watson sound like real, actual people, you’ve failed! If you follow these 5 totes wicked tips, you can’t go wrong as a pastiche writer. Just remember, Sir Arthur Conan Doyle already hates all of us anyway, no reason to stop fueling the afterlife rage. (Note: In my life, I abide by the adage that a joke once explained is no longer funny; I had also hoped that my ridiculous mode of expressing myself would indicate my broadly comic intentions. Alas, as is often the case on these interwebs, satire cannot be left on its own without engendering unfortunate misunderstandings. 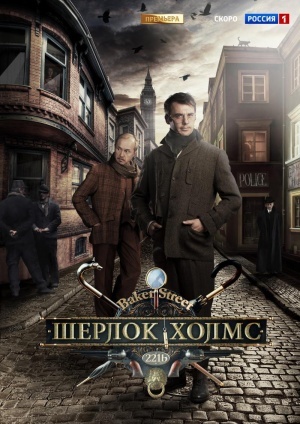 This post will contain mild spoilers for the third episode of the Russian Sherlock Holmes series but should keep most of the surprises intact. The third episode of the new Russian Holmes series (watch here; turn on English subs if needed) is an action-packed romp through director Andrei Kavun’s vision of Victorian London. Much like its predecessor, it’s very action-heavy, and it seems that the first episode is the only one that moves remotely slowly in that way. In many ways, “Clowns” is really the emblematic episode of this series, because it brings together each of the threads the creators chose as their emphases. 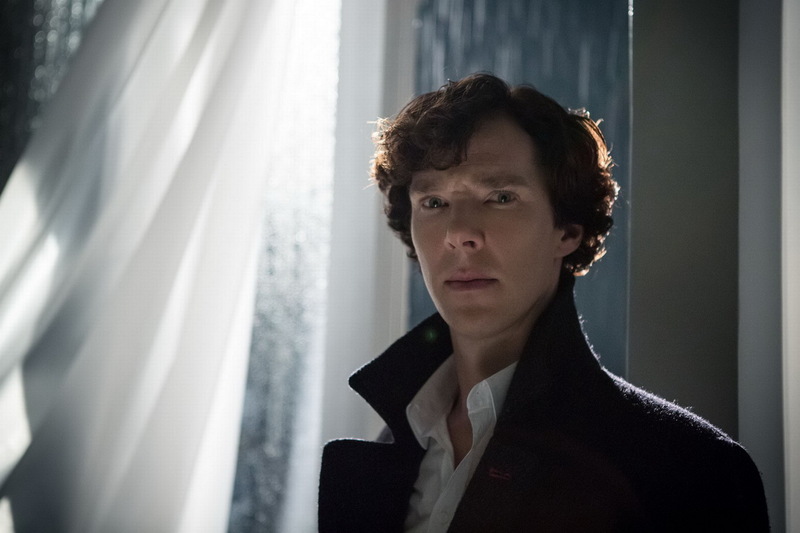 The previous introduction of Irene Adler was not, we see, a one-off. She’s back, and her presence wreaks havoc with the lives of Holmes and Watson. Allusions to “A Scandal in Bohemia” are woven together skillfully with a politically-focused story reminiscent of “The Bruce-Partington Plans” and even snippets of “Charles Augustus Milverton.” Over all of these hangs the specter of what we are now shown is a series arc that relates back to Watson’s military career and continues to cast him as a tragic figure losing friend after friend. I would be remiss in not mentioning that “Clowns” contains the most magnificent plot twist of the series so far, a clever reversal I really didn’t see coming. Several criticisms I had while watching the episode were completely resolved by it, and I applaud whichever of the writers came up with the idea. My major remaining critique is of the portrayal of female characters. The original introduction of Irene cast her as a powerful, self-directed woman. This episode gives her layers, but in so doing, it also diminishes her strength and throws her into the more traditional damsel in distress role. Ultimately, I am comfortable with the characterization of her complicated relationship with Holmes, but I wish she had been allowed to retain her confidence in the process. The episode’s other major female character is also shown to be weak and somewhat useless throughout. “Clowns” is a good episode, though I felt that its writing fell just shy of “Rock, Paper, Scissors.” Nevertheless, its truly clever plot made up for certain bumps along the road, and Petrenko and Panin really dug into their roles in a spectacular way. Panin’s Watson was still excellent, but it was Petrenko who had the difficult task this time around, to portray a Holmes made desperate by events beyond his control. His communication of the layers of frustration and deception the story demanded was exceptional. In the end, one particular conversation from the episode remains in my mind. It’s just after a very climactic point in the action, and Holmes and Watson muse together on the futility of life in a way that reminded me powerfully of “Waiting for Godot” and many similarly philosophical Russian works. In my opinion, that emphasis on finding the meaning below the surface of the Sherlock Holmes stories is what makes this series sing. It’s not a particularly Western touch, where we like our stories fast and our characters brash, but it’s a truly beautiful one. 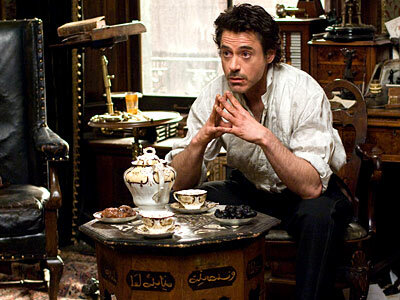 This past weekend, I rewatched 2009’s Sherlock Holmes and 2011’s A Game of Shadows after not doing so for a few years. These films, directed by Guy Ritchie and starred in by Robert Downey Jr and Jude Law, have always been polarizing, ever since they were first announced. 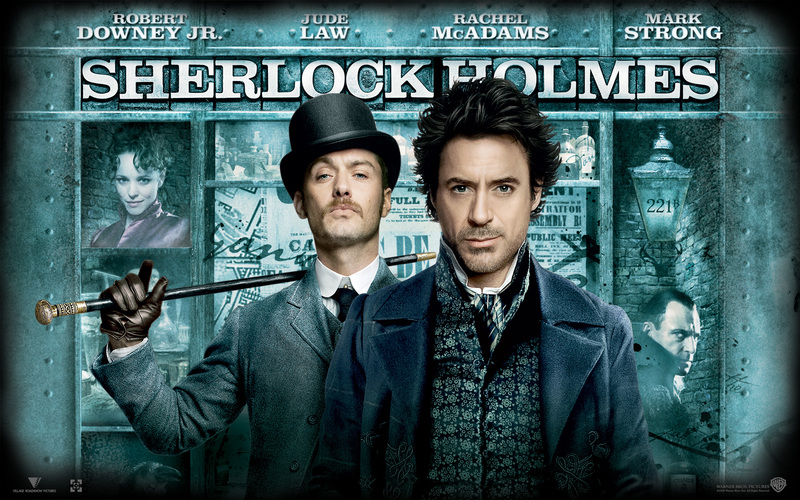 When Sherlock Holmes came out in 2009, the Holmesian world looked very different. There was no Sherlock, and there was no Elementary. There were Scion societies and people who enjoyed Holmes very much, but it was not the global, Internet-era phenomenon it soon became. I saw the film in the theater having not read any canonical Holmes stories for many years, my main link to that world being the Laurie R. King Mary Russell series. Beyond her, I hardly knew such a thing as Holmes pastiche even existed. When Sherlock hit in 2010, everything changed. By the time I saw A Game of Shadows in the theater, I had re-read the Holmes canon and written my first Holmes novel, The Detective and The Woman, and generally become astronomically more Holmes-literate than I had been. The two experiences were intensely different from one another. I saw Sherlock Holmes as a casual consumer. I saw A Game of Shadows as a superfan. Now, years later, I rewatched the two back-to-back to try to unpack my real feelings about the films. I’m going to talk about them as a unit, because that’s how I viewed them. First off, I like them. I like the humor. I like the atmosphere. I like the action sequences. I enjoy the fact that for once, it’s not all serious business. I went back to them with the memory that they’re not purist adaptations and was pleasantly surprised by how close they really are in a lot of ways. If you like your Holmes straight-up serious, they’re not for you, but I like a shot of humor in mine, as did Doyle, since he wrote a huge amount of tongue-in-cheek humor into the stories that I only recognized as an adult. Third, the casting is fantastic. I know that a lot of people balked, and still do, at the idea of Robert Downey Jr as Sherlock Holmes, but there’s a reason the man is in possession of a Golden Globe Award for it. I have read interviews in which he talked about spending countless hour upon hour preparing, and that comes through. Of all the actors I’ve ever seen portray Holmes, his articulation and pacing of lines might be, in my opinion, the most canonical. When I’m watching him talk through deductions, I get the exact feeling I have when I read the Doyle stories. I really can’t ask for more than that. Sure, he’s a quirky Holmes, more Columbo than Poirot, but that’s definitely an interpretation that comes through in the 60 stories Doyle wrote about the character. Sometimes we read about Holmes’s urbane side; other times we see his awkward, endearing vulnerabilities, and that’s what Downey shows us. So what if he’s not tall? There’s a longstanding theater tradition of casting actors who are physically different from characters they play. It works because acting is about being something you’re not. In this case, he carries it off, if you give him a chance. 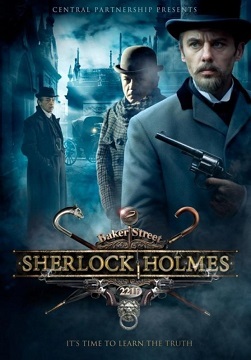 Jude Law as Watson and Jared Harris as Moriarty are less-contended choices, and both give brilliant and very canonical takes on the characters. Fourth, the action is fun. 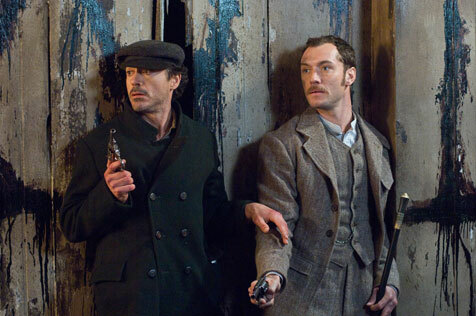 When the first film came out, a lot of people were bothered that Holmes and Watson were so action-ready. These individuals appeared to have forgotten that the canonical Holmes is a baritsu (bartitsu) and boxing expert, and Watson is a gun-toting, far-from-squeamish veteran of a very nasty war. Several of the stories contain action sequences, and it’s only cultural distillations of Holmes that have made him into a Poirot-like thinking machine who rarely moves from his easychair. First, the choice of Holmes’s sexuality is questionable. Ritchie wisely doesn’t depict anything explicit on screen, but it’s clear the detective has a history with Irene Adler. A lot of people have done this, but it’s more of a nod to cultural perception and other adaptations than the canon. 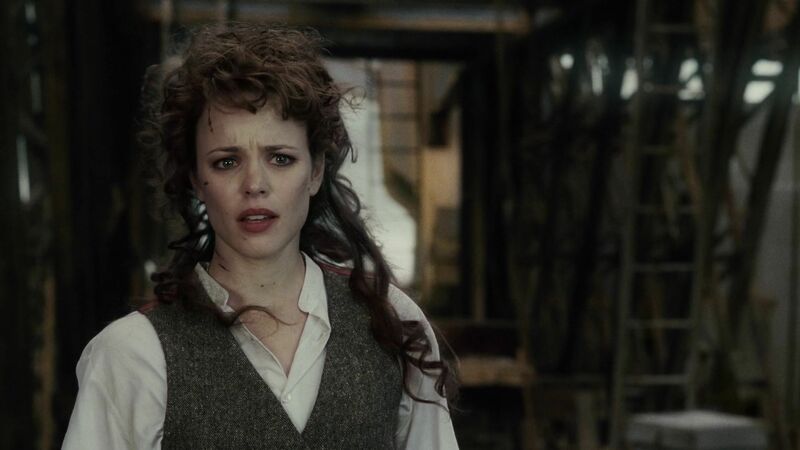 Irene, I think, works as a character in her own right in these versions, but I’m not insanely enamored of giving her a specific romantic history with Holmes, though Downey and Rachel McAdams make the scenes themselves work. Second, Irene’s connection with Moriarty is also not my favorite. Granted, in the context of the movies, making Irene the bridge to Jared Harris’s chilling Professor Moriarty was a continuity-boosting narrative choice, but I’m not usually a fan of the film penchant for taking disparate characters in a big franchise and smooshing them together with each other in slightly lazy ways that bear no resemblance to the original. It works in the context of the films, but it’s a canon difference that is always in the back of my mind when I’m watching. First, the “Ritchie Technique” is overused, especially in A Game of Shadows. If you’ve ever seen one of these films, you know what I’m talking about. There’s slo-mo, there’s freezing people on screen, there’s blowing things up-making huge things fall down-explosions and reverse explosions. I don’t dislike any of it individually, but there’s too much of it. This is more of a stylistic comment; even if these weren’t Holmes films, I would find the length and amount of artsy action sequences a bit tiring. Second, the plots get overcomplicated. This is specifically a criticism of A Game of Shadows. 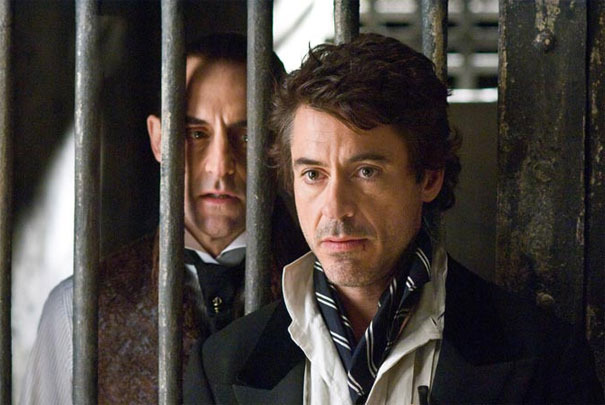 I find Sherlock Holmes to be the superior film because its plot is simple and clear, the driving through-line of Mark Strong’s Lord Blackwood and his nefarious deeds. Shadows gets muddled in the middle. We meet Moriarty, but then a lot of other things happen before we get back to the simple, clear issue of two equally-brilliant men facing off with each other. One of the genius things about Doyle is the clear simplicity of his mysteries that doesn’t detract at all from their cleverness. Sherlock Holmes replicated this clarity; A Game of Shadows would have benefitted from some revision to get there. Overall, I count myself a big fan of the Ritchie-verse. 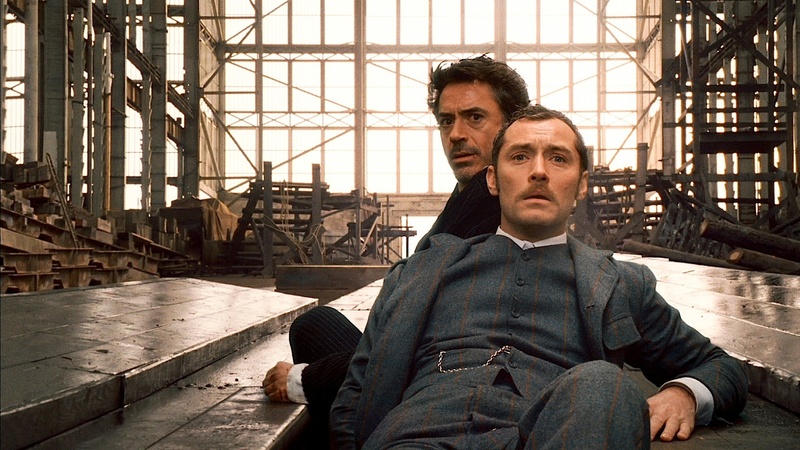 A third film is supposedly in the works (finally), and I look forward to seeing the post-hiatus conception of Downey’s Holmes and Law’s Watson. If you’re someone who dismissed these adaptations at some point on your Holmesian journey, I recommend giving them a second chance. Now that I’ve been part of the Holmes-verse for over three years, I’ve come to the conclusion that no adaptation is perfect, but almost all of them say something unique about the Holmes canon that others skip. The Ritchie films are not my favorite Holmes adaptations, but they’re immensely enjoyable, and they elaborate on the humor, humanity, and pure joy of Holmes in a way I’ve never seen another adaptation equal.